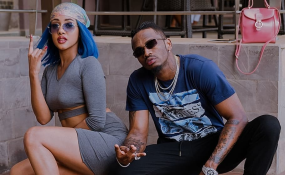 In what continues to be an interesting developing love story, this week a new twist emerged as Singer Diamond Platnumz paraded his latest love interest Tanasha Donna in front of his family. A short video clip on Instagram was all the fans needed as Diamond, in an effort to persuade Tanasha to come out of the bedroom to meet her Tanzanian in-laws, decided to capture the entire scenario on camera. In the video, Diamond's mother, sister and other close family members were present before the family decided to have dinner together with the leading lady in Diamond's life. What is interesting is that, this love, which is being heatedly followed by both fans and foes, continues to gain traction as bystanders are left guessing the fate of the relationship. For now, the romance seems to be catching steam as days go by, but let's leave it to time to reveal the final destination of what has become East Africa's top couple. We are not prophets of doom, nor do we wish this couple bad omen, we just want nature to take its natural course.